The American Wigeon was formerly called the Baldpate, because the white forehead of the male was said to resemble a man's baldhead. This white crown is conspicuous when these ducks are in mixed flocks in grain fields, marshes and shallow water. The breeding range of the American Wigeon extends from the Bering Sea to Hudson Bay and from the northern tundra to the southern prairies. The greatest numbers winter on the Pacific coast, but it is also found in the southern United States southward to northern South America. 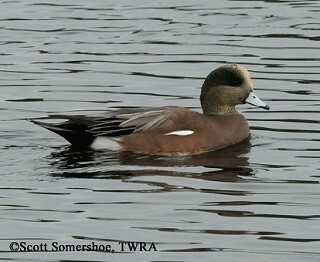 The American Wigeon is generally present in Tennessee from late September to early May. Description: The forehead and top of the male’s head is white, and he has a dark green patch through the eye. The female is dull gray and rusty brown overall. The bill of both the male and female is small and bluish-gray with a black tip. In flight, the male has a large white patch on the upper-wing; the female has a smaller patch. Both have white “armpits” on the under-wing. Voice: The male has a high 2 or 3-syllable whistle, resembling a squeaky toy. 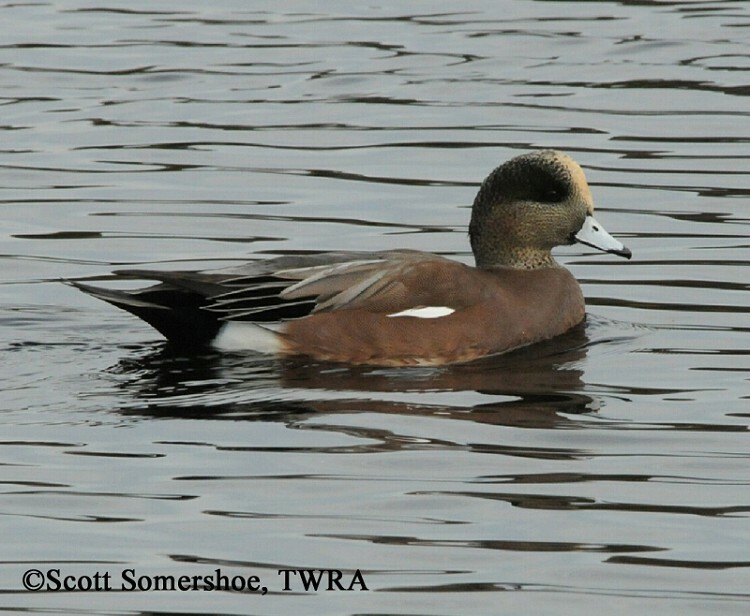 Eurasian Wigeons, extremely rare in Tennessee, have gray “armpits” on the under-wing. Habitat: In Tennessee they are found on shallow ponds, lakes, rivers and in grain fields or on mudflats. Diet: Mostly eats aquatic plants during the winter. Nesting and reproduction: The American Wigeon has never been known to nest in Tennessee. Status in Tennessee: Fairly common migrant and winter resident arriving by late September and departing by early May. The short bill of the American Wigeon gives it the strength to harvest certain aquatic plants that are not available to other duck species. Populations declined by as much as 50 percent in the 1980s as a result of an extended drought in prairie regions. Since then, the population has largely recovered. The oldest known American Wigeon in the wild was 20 years, 11 months old. Best places to see in Tennessee: Waterfowl refuges across the state. Mowbray, T. 1999. American Wigeon (Anas americana). The Birds of North America, No. 401 (A. Poole and F. Gill, eds.). The Birds of North America, Inc., Philadelphia, PA.